by Brianna Crandall — June 25, 2018 — Formica Corporation, global provider of branded and designed surfacing solutions, introduced soon-to-be-released laminate designs at this month’s Neocon 2018 contract furnishings show in Chicago, including two that may be of particular interest to facilities managers (FMs): Intentek, with built-in automatic wireless charging, and ColorCore2, with built-in antimicrobial properties, which snagged a Gold award in the Surfacing Materials and Finishes category of the prestigious Best of NeoCon Competition. Available August 2018, the Gold-winning Formica Infiniti ColorCore2 Laminate, said to be as beautiful as it is durable, features a soft-to­-the-­touch super matte finish that is fingerprint­resistant, offers antimicrobial surface protection and thermal healing capabilities, and features a matching colored core that eliminates the brown edge typically seen with laminate. 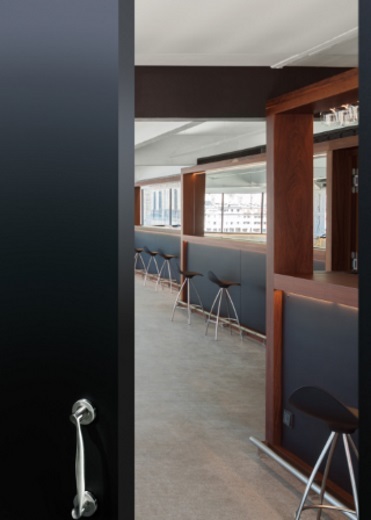 Formica Infiniti ColorCore2 laminate is suited for commercial settings such as hotels, restaurants, retail, offices, higher education and health-care lobbies. The product can be applied horizontally or vertically and is suitable for casework, countertops, furniture and signage. ColorCore2 Laminate: An expanded ColorCore2 Laminate line continues to feature an upscale look with clean “no brown line” edges. The collection will contain multiple new color and pattern offerings. Compact is available in four highly useable solid colors — Black, Navy Blue, Mouse and Mojave — as well as multiple patterns with a coordinated color core. The product is ideal for restroom and wall partitions, tables, lockers and wall cladding. As an answer to the growing demand for charging stations available to people in commercial settings, Formica Group and ConvenientPower Systems have partnered to create Intentek, a Formica Laminate surface that can wirelessly charge Qi compatible mobile phones simply by placing devices on it. Intentek laminate is intended for horizontal applications for commercial spaces in hospitality, retail, health care, education and office settings. The company expects to make the technology available for residential applications, including countertops, in the future. The Intentek beta will begin rolling out globally in the next few months, with the product becoming more broadly available in the next year. Formica introduced six new designs to the DecoMetal Metal Laminate range, bringing a touch of luxury, glamour and metallic authenticity to surfaces. A new matte series features Matte Bronze, Matte Graphite and Matte Rose Gold colors. The collection also adds new patterns Oxibronze and Labyrinth. Oxibronze is inspired by nature’s living metals and features an organic fluid effect. A play between warm metal tones, this sophisticated material is hand­finished by craftsmen. The layered process of polishing, staining and re-polishing real brass foil results in each sheet of Oxibronze being totally unique. Labyrinth is a large-scale geometric design available in both Bronze and Rose Gold. The geometric design and matte metallic colors were created in response to leading architects’ and designers’ strong desire for patterned and large-scale drama in a wider range of colored metals. Available October 2018, HardStop is a new decorative protection panel with superior impact resistance that will be available in the full spectrum of Formica Brand color ranges. Unlike traditional laminate that contains a paper core, HardStop features a fiberglass core for added durability and strength. HardStop is impact- and water-resistant, easy to clean, dimensionally stable and has a Class A fire rating. HardStop can be applied directly to drywall and is suitable for vertical applications in settings such as hospitals, restaurants, schools/universities, airports and elevators. For more information, visit the Formica Corporation website. Which workspace factors are key to keeping employees happy and engaged? See what this industry study found October 5, 2018 In "Surveys and Trends"
NeoCon 2018: New Keilhauer Best of Competition collection emphasizes worker flexibility and productivity by empowering the solution that works best for each individual June 22, 2018 In "Products and Services » Furniture & Furnishings"
Concerned about Zika and West Nile Virus? Check out this interior paint that fights mosquitoes April 25, 2018 In "Products and Services » Safety and Health"